SoftExpert Analytics is a software that allows anyone to easily connect to data, visualize and create interactive and shareable views. It enables companies to take what seems to be an indecipherable mass of facts and extract any trends and patterns buried in the data. Users can arrange and summarize data, perform comparisons, and extract meaningful information that can be inestimable to the organization. 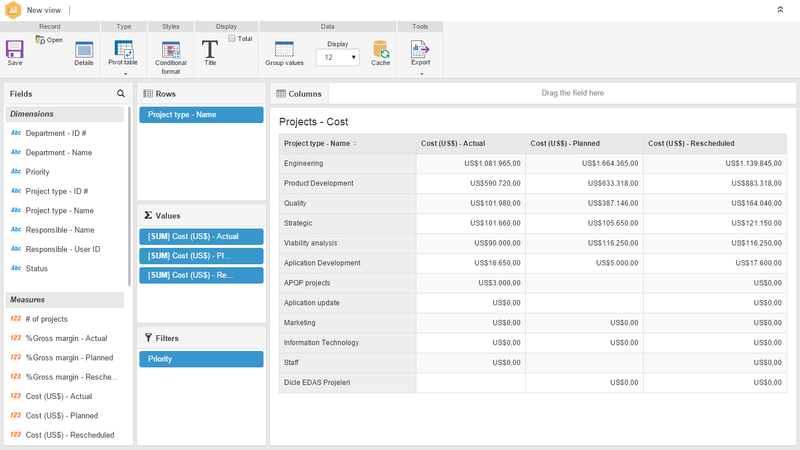 The solution enables users, for the first time, to connect to non-OLAP or relational data sources such as ODBC supported databases, OLAP (Online Analytical Processing) sources and even Excel and CSV files, and create fully interactive reports, featuring all OLAP resources, in just a few clicks. SoftExpert Analytics also offers an integrated, robust and flexible presentation layer for the full extent of SoftExpert Solutions capabilities, including statistics, predictive analytics, queries, comparisons, etc. The results can be published online using portal capabilities. Graphs, charts and tables with custom drill down. A rich variety of charts. Information can be exported to Excel. Graphs can be exported to PNG and other extensions. Customized cell styles and format. Web and desktop reporting (portals). Drill down and Roll up (Zoom in on information and/or zoom out back to the origin). Rotate, slice and dice (Flexibility to obtain information). 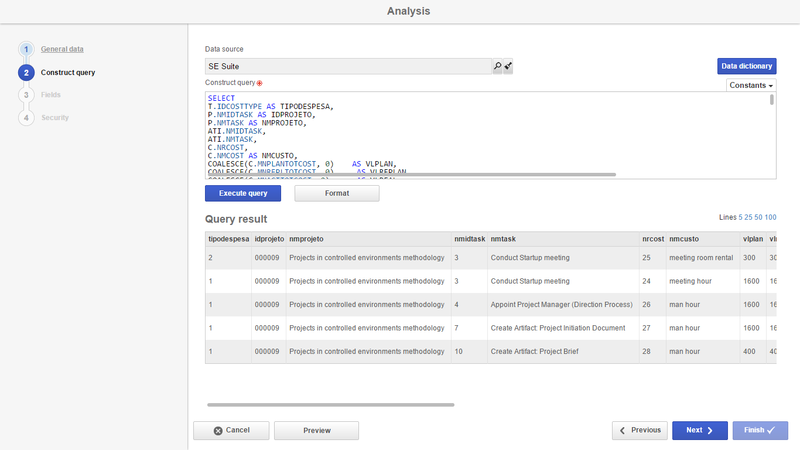 OLAP Application (On-line Analytical Processing) concept. Unlimited crossing of information (rows x columns). Drag and drop to rearrange pivot fields by users. Automatic calculate summary for your data. It supports SUM, MAX, MIN, COUNT, AVG by defaults. Automatic calculate total and grand total for row fields and column fields. Analytical features like ranking, filtering, sorting, group by etc. Saving profile and load it back. Data extraction from existing ERP systems, other business transaction applications, relational databases and data files. Wizard-based functionality supports multiple data sources and multiple file types. Source data can be selected from multiple tables in a SQL join. All infrastructure provided through a single interface, a single metadata, a single code base, and a single server process. 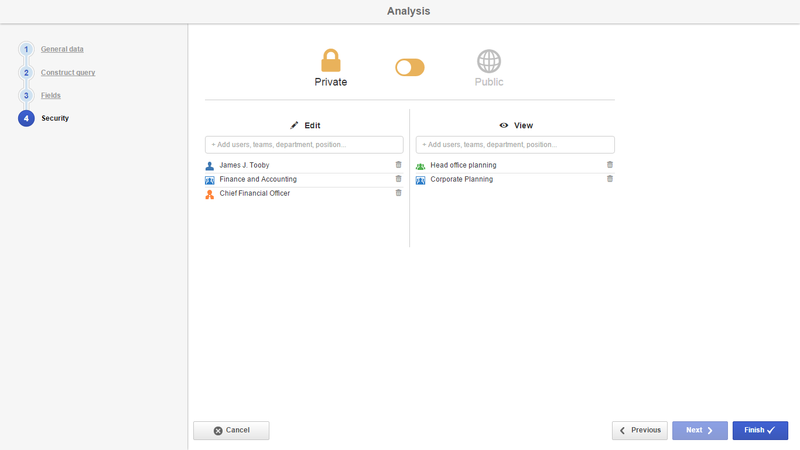 Security configuration for each analysis. 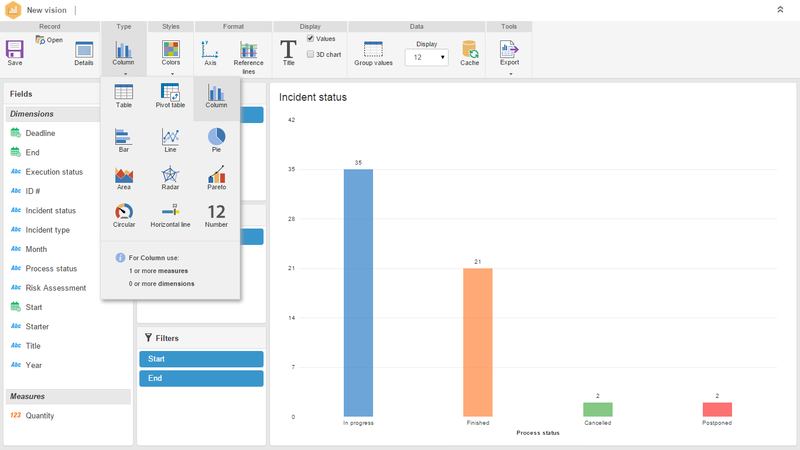 How to create great KPI dashboards, describing every step you need to take to implement them at your own organization.